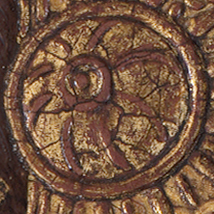 Explore the hallmarks of Crivelli’s distinctive style through comparisons and highlights. 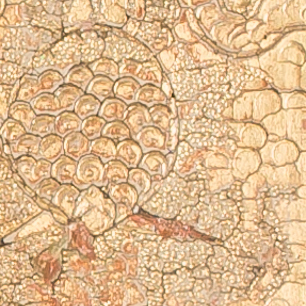 Fruit, flowers, and richly textured backgrounds can be seen in this gilded detail. 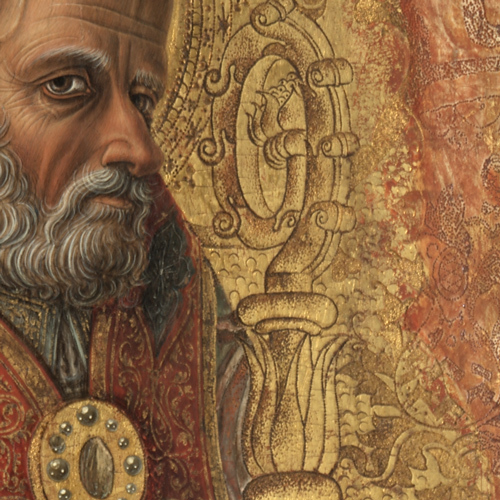 Crivelli used both punches and a stylus to achieve this complex ornament. 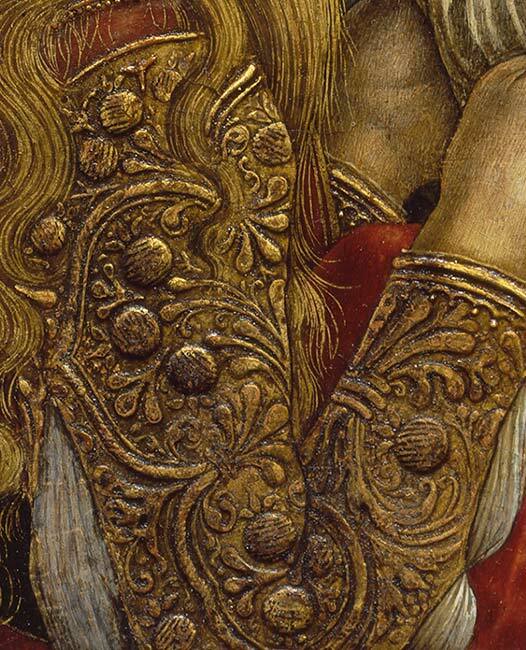 Crivelli enlivened countless paintings with punched and incised gold leaf. In a candlelit church, their floral patterns and geometric motifs caught the light, glistening across every gilded surface. 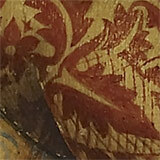 The raised, detailed pattern of this sleeve is not just a trick of the eye. 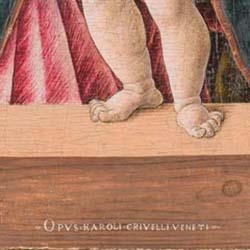 Crivelli built up its decorative surface with care. 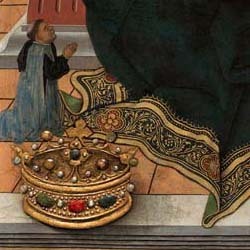 He then added gold leaf and shaded it with paint to suggest stitching. 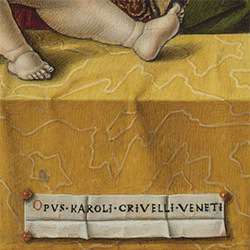 Crivelli’s paintings bristle with embossed ornament. 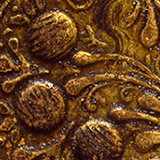 Sculpted from gesso in low relief, pastiglia simulates the texture of rich velvet brocades, elaborate armor and precious metalwork. 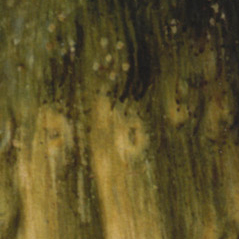 It catches the light, enhancing each illusion with three-dimensional form. 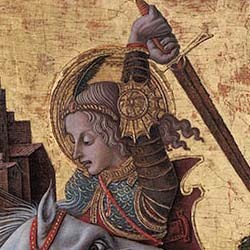 Saint George’s armor is sculpted and gilded to simulate embossed metal. 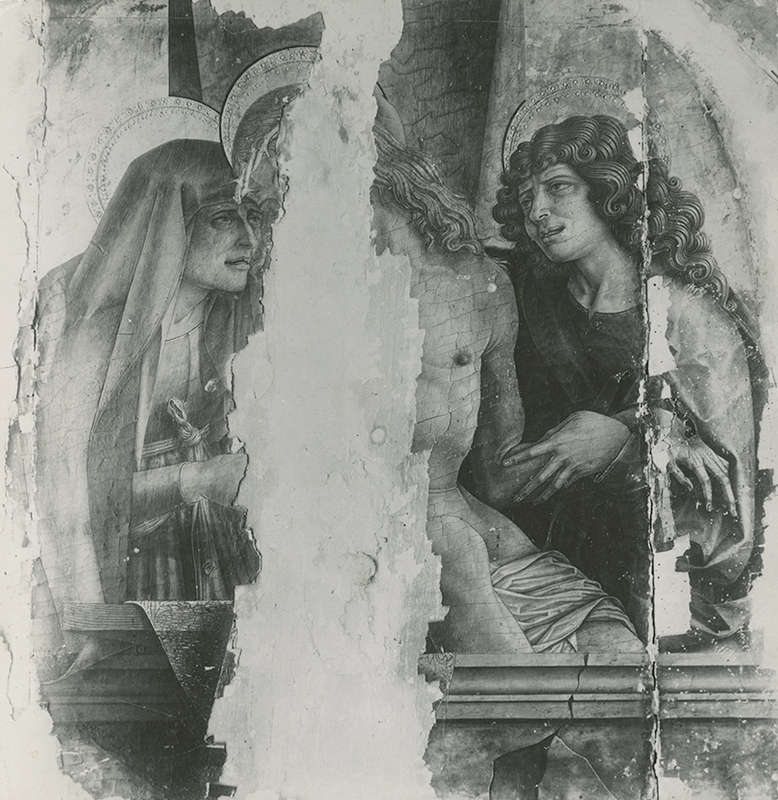 Learn more about pastiglia in Beneath the Surface. This starburst shape simulates the elbow protection of an actual suit of armor. 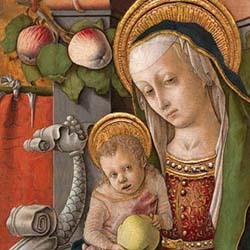 Fruits, vegetables and foliage crop up in each of Crivelli’s religious images. 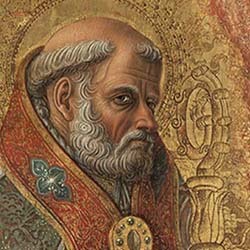 Hung in garlands, they celebrate Christ, the Virgin, and the saints with a motif borrowed from classical antiquity. 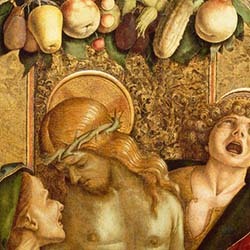 The garlands also recall a Christian ritual practice in the Marches: adorning cult images with harvest offerings. 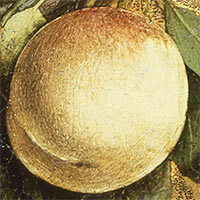 Crivelli painted this peach with subtle brush strokes that suggest its soft skin and ripe interior. Light falls from the right, casting a shadow and rendering the fruit so realistic that it looks good enough to eat! 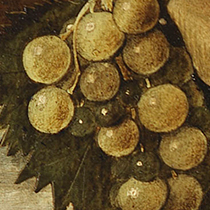 These translucent grapes reflect the light like glass, a stark contrast with the opaque green of the leaves behind them. 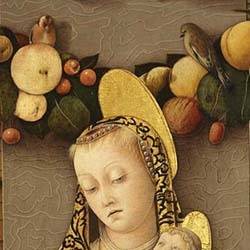 Like the other fruits, they appear to stand out against the painting’s surface, tempting treats for the hungry bird above. 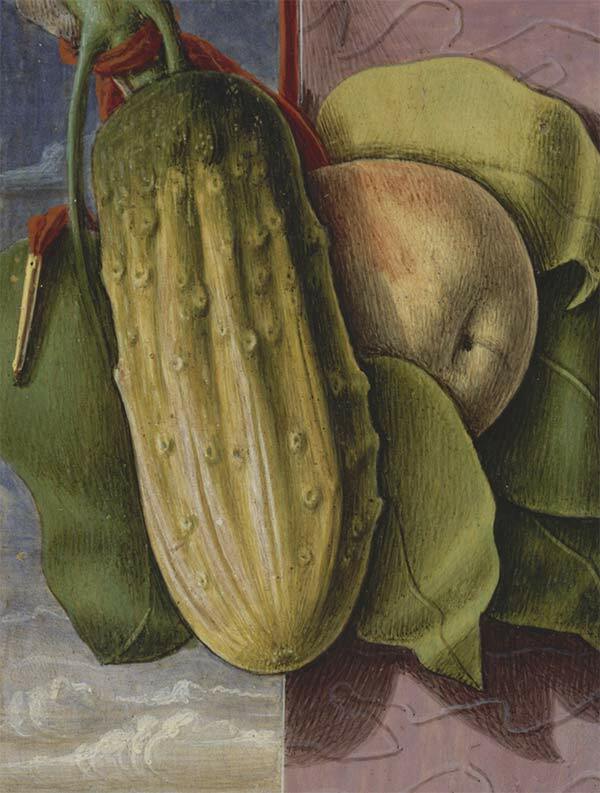 Crivelli perfectly captures the uneven, dimpled surface of this harvest-ready cucumber. 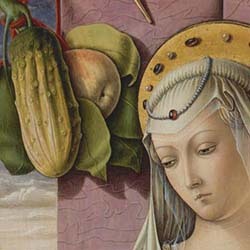 Larger and more detailed than the other elements of this garland, the cucumber calls attention to itself and so to Crivelli’s painting technique. 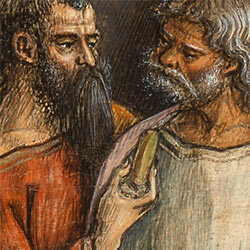 Crivelli used the cucumber as a signature device. 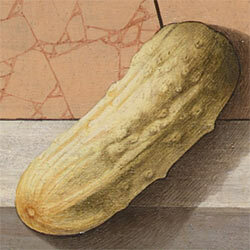 He rendered this protuberant gourd in astonishing trompe-l’oeil, demanding recognition and urging viewers to admire his painting technique. 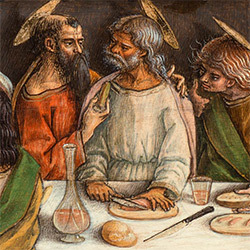 For Crivelli, this food even featured on the menu at Christ’s Last Supper. 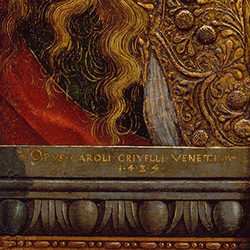 Crivelli inscribed many paintings with his signature, “Carlo Crivelli of Venice.” Painted or gilded on fictive wood, stone and paper surfaces, they invite the admiration of his artistry. 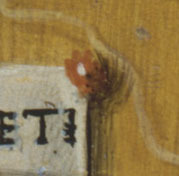 Here, the artist puts his mark on a small scrap of paper. 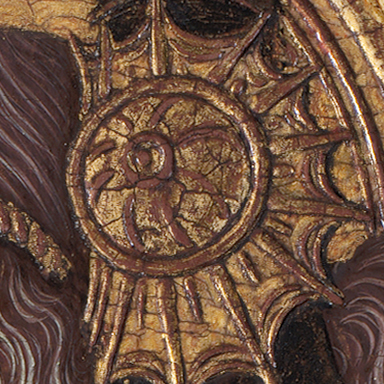 Notice the tiny daubs of wax in each corner. 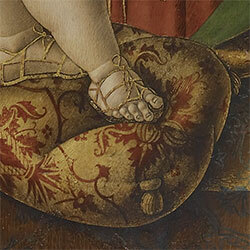 Crivelli cleverly tricks the viewer’s eye, painting the sheet as if it was sealed to the painting’s surface. 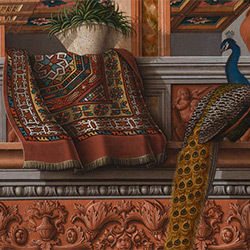 Crivelli’s fabric fantasies feature in all of his paintings. 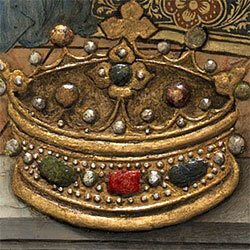 Rendered in paint and gold, each textile is individualized, from humble handwork to regal brocades. 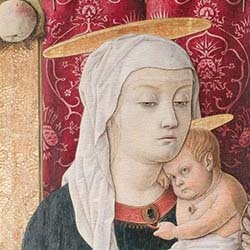 Crivelli often uses fabrics to signal the relative importance of saints, with the Virgin Mary and Christ above all others. 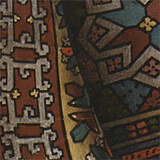 Rugs like this one were a sign of prestige. 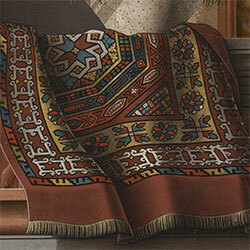 From its shaggy fringe to its loose folds, this geometric textile is painted in exquisite detail. 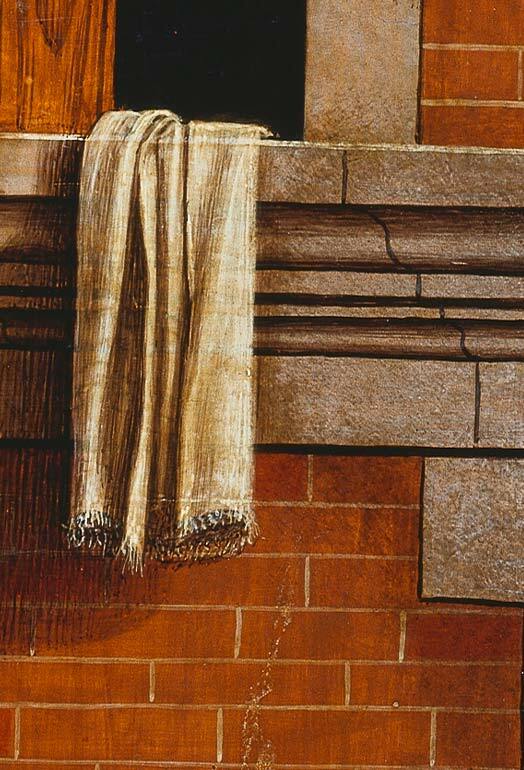 The jacquard fabric of this tufted cushion is fit for a king. 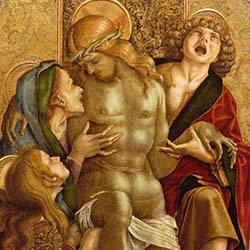 Crivelli simulates cloth-of-gold, the most expensive textile available. 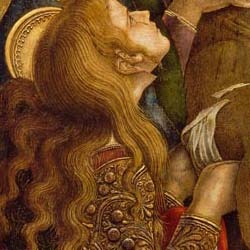 Only Christ is accorded such regal treatment. 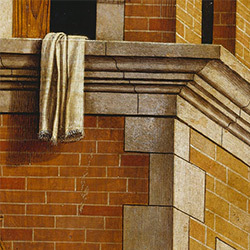 Crivelli envisioned parapets of wood, stone and marble. 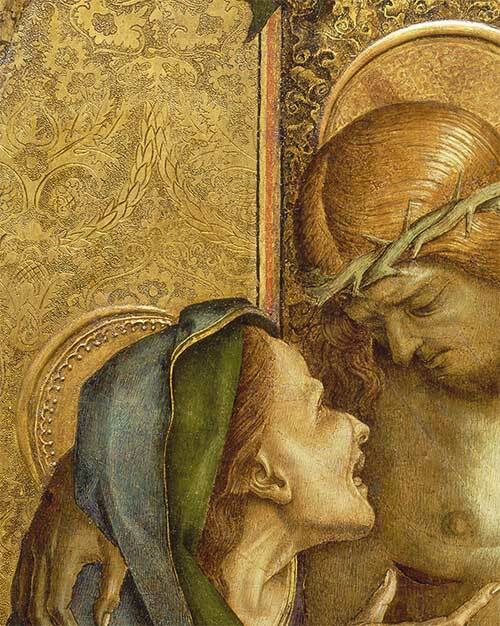 Each threshold invites inspection and opens up a reverent distance. 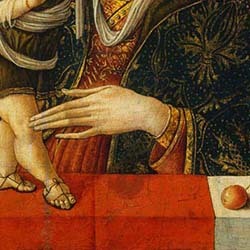 Perched on the verge, Christ is close enough to touch and yet beyond our reach. 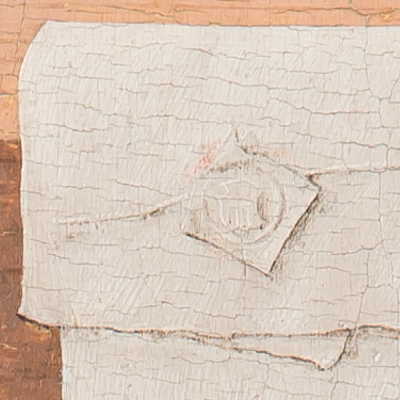 This folded letter is perched in front of the wooden parapet at the edge of the painted surface. 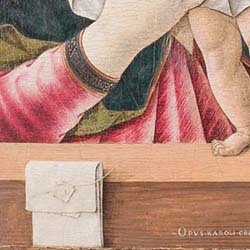 Crivelli tricks the viewer into imagining that the note is real, wedged between the painting and its frame (now lost). 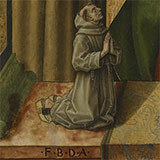 The small scale of this friar and his prominent placement on the parapet identify him as the donor of the painting. 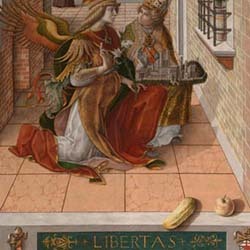 He kneels before the Virgin and Child in perpetual prayer.